For the first time in 38 years, the Port of Fort Smith has a new building on its property to accommodate additional cargoes on the Arkansas River. 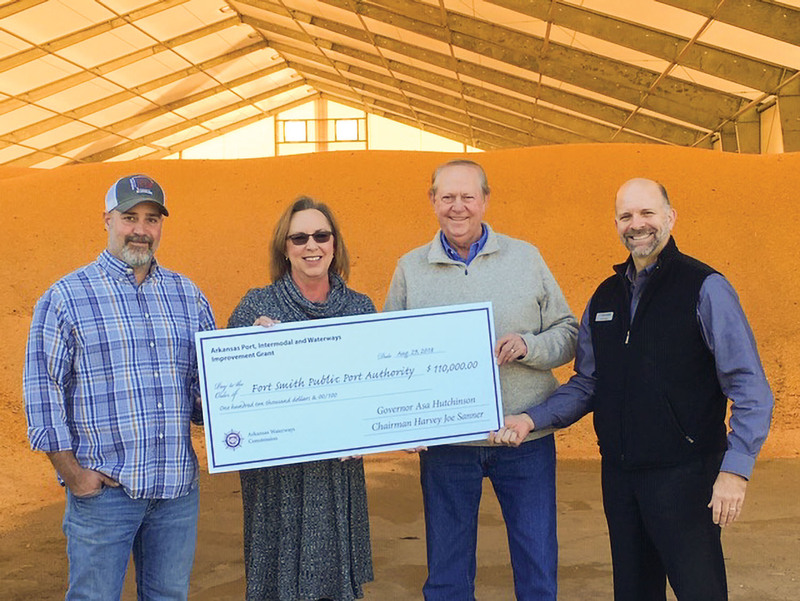 The 30,000-square-foot bulk storage facility recently opened at the port and was built over the course of several months with a $110,000 matching grant from the Arkansas Waterway Commission’s Arkansas Port, Intermodal and Waterway Development Grant Program. The grant, which was presented to the port on August 28, was one of four grants awarded to public ports and intermodal authorities to make capital improvements and allows for much needed dredging projects. Last year, the Fort Smith Port Authority received more than $500,000 from the grant program to build the facility at the port, which is operated by Five Rivers Distribution. Marty Shell, president of Five Rivers, said the new dry storage facility is currently being used for bulk storage of an animal feed product. “It’s the first new construction since 1980, and it wouldn’t have happened without the Arkansas Waterways Commission,” said Shell. The Arkansas Waterways Commission is the sole state agency responsible for developing, promoting and protecting waterborne transportation in Arkansas. The commission also promotes economic development for ports on the five commercially navigable rivers of the state: the Arkansas, Mississippi, Ouachita, Red and White rivers.